Anthropology is the study of all aspects of humanity, from our evolutionary origins to our extraordinary social and cultural diversity. Click here to view the courses on offer! Would you like to be taught and/or supervised by only the best staff who are experts in the field? See our range of courses here. View our staff speciality here! Being one of the largest departments of Anthropology in the UK, we have world-leading expertise in a range of topics. Founded in 1967, the Department of Anthropology at Durham is now one of the largest integrated anthropology departments in the UK carrying out innovative research on cutting edge topics spanning social anthropology, evolutionary anthropology, and the anthropology of health. Our academics and postdoctoral researchers employ a wide range of social science and natural science perspectives to explore questions about human life in its evolutionary, environmental and cultural contexts. Our taught programmes offer students the opportunity to pursue general and specialist anthropology programmes at undergraduate and postgraduate levels, while our PhD students study topics from primate behaviour to rhetoric culture and indigenous knowledge to internet technologies. With our first-class facilities, innovative programmes, and world-leading academics, Durham is setting the agenda for 21st century anthropology. Professor Helen Ball and the Sleep Lab Team were recognised with the prestigious Queen's Anniversary Prize for 2017. The Prince of Wales and the Duchess of Cornwall present the Queen’s Anniversary Prize to Professor Helen Ball, Director of the Parent-Infant Sleep Lab, and Professor Stuart Corbridge, Durham’s Vice-Chancellor, at a ceremony in Buckingham Palace on 22 February 2018. 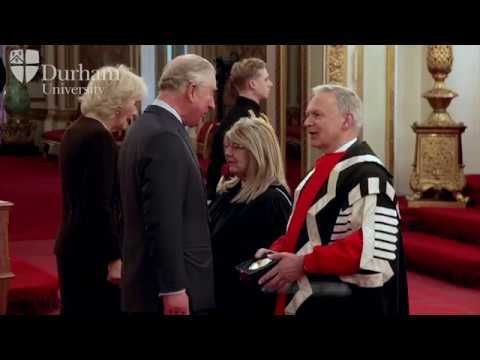 The award is in recognition of the University’s leading influential research on parent-infant sleep, and the ceremony is followed by a reception where the Duchess of Cornwall meets PhD students who have worked on Sleep Lab research projects and the manager of the Parent-Infant Sleep Lab, Dr Charlotte Russell. Co-authored by Durham Anthropology's Prof Gillian Bentley, a Durham University-led study published in Nature Ecology & Evolution suggests that men who grow up in more challenging conditions where there are lots of infectious diseases, for example, are likely to have lower testosterone levels in later life than those who spend their childhood in healthier environments. DurhamARCTIC is a doctoral training centre at Durham University, funded by a grant from the Leverhulme Trust to support Interdisciplinary Understanding for a Changing Arctic (DS-2017-070). Between 2018 and 2023 DurhamARCTIC is supporting 15 doctoral students at Durham University, each of whom is pursuing a research project that contributes to and benefits from a blend of disciplinary expertise and interdisciplinary enquiry. “Our Lives with Electric Things”: Durham anthropologists publish a new collection of writing to extend the energy humanities. Inspired by a Wenner-Gren funded workshop held at Durham in 2016, this new collection has been published in the Cultural Anthropology journal series ‘Theorizing the Contemporary’. The full collection includes 51 contributions, whose authors reflect on our lives with electric things, using electric artefacts to generate novel ethnographic insights. Editor Professor Simone Abram says, ‘This collection is an inspiration for anthropologists and others to rethink how we live with electricity and reconsider the possibilities and limits of life with electric things’. With three co-editors from Edinburgh and Copenhagen, the collection covers electric fictions, backups, infrastructures, electric sustenance, electric air and more, making up 17 themes. ‘We are excited to bring together anthropologists from around the world to think about such pressing issues and invite readers to enjoy the collection and the inspiration it offers’ adds Prof Abram. New opportunities for MSc Energy and Resilience students. Click here for more information.